In a previous post here about self-employed earnings after the release of HMRC’s latest taxpayer income statistics, I’d wondered about whether it could possibly be right that 77% of self-employed people could be living in poverty. The HMRC-published figures didn’t make it possible to say very much about the extent to which self-employment earnings were supplemented by other kinds of income or vice versa. This was essentially the same sword and shield theme as my previous comments here on an RSA piece by Benedict Dellot. I’ve now got some more detailed information under the FOI that throws a bit more light on the issue. Getting information under the FOI is not always an easy task, and the ability of government to refuse to provide it on the grounds that it would cost more than £600 to do so means that you have to take a best guess about what data might be held, the form in which it might be held, and what might be available with the least amount of work on the part of the department. Such self-imposed limits do mean compromise, and so what follows is still in many ways only illustrative. 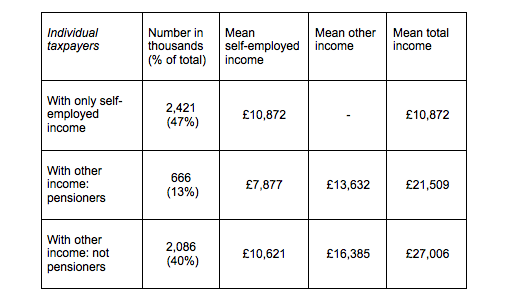 In the table and charts below I’ve taken out the small number of people with self-employment income of over £100,000 in the year so that the means are not too distorted by a few very high earners. 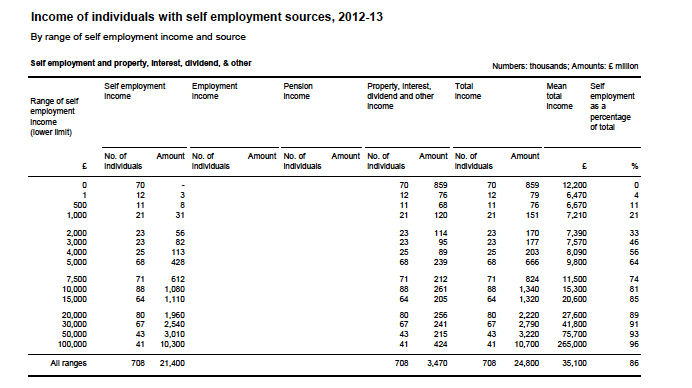 It’s clear from these data that taxpayers who have only self-employed income don’t get very much from it. However, fewer than half of taxpayers with self-employment income have this as their only income. And of course these are individuals, so while they may have only self-employment income, they might not be the only earner in a household or the main earner. There are a number of ways to cut the cake, and the table below distinguishes people with self-employed income only from those with other income as well as self-employed income. 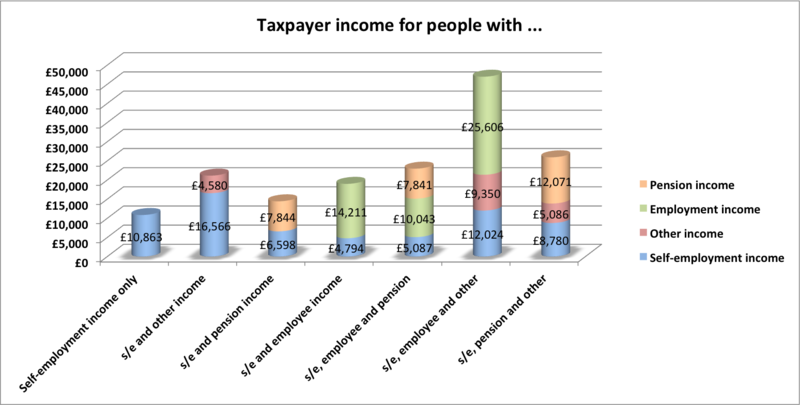 The latter group are split into individuals with pension income I've called ‘pensioners’ and those without. Some of these ‘pensioners’ will be people below state pension age who are receiving occupational or private pensions. These aggregate data from seven tables in the FOI reply that look like the one below and go through all the permutations of self-employed income by bands with each kind of other income. As government data belongs to all of us, and others might find something useful for their own purposes in it, especially from a distributional point of view, I've put the full FOI reply here. At risk of sounding repetitive, these data provide another indicator of poor rewards to self-employment for quite large numbers of people. They are also further support for the suggestion that employee income provides more security for households at lower income levels than self-employment. Caution too that these figures are for 2012/13. Much data on self-employment can be challenged on the grounds that they don't cover activities in the 'informal economy'. HMRC figures can always be criticised for not including under-declared income, but their figures are from people who are actually declaring self-employed income, and subject to compliance checks and enforcement activities. They obviously don’t include figures from people who are under the radar altogether, but then people who aren’t telling HMRC they are working probably aren’t telling interviewers conducting the Labour Force Survey or Family Resources Survey either!